January | 2013 | hello it's ming. After spending a wonderful afternoon in the city catching up with ‘Wifey’, one of my closest friends, followed by the comedic interruption of Lil’ Bro who came to join in on our ‘chit chat’, it was time to meet Mumma and Pappa for dinner. Lil’ Bro was abandoning us for dinner to meet up with some friends in the city, so as the remaining three; we went on the hunt for a simple yet tantalising meal. After following one of my favourite blog’s “Street Food”, I began to patronise ‘Sussex Street Food Centre’, which is definitely a melting pot for all things Asian. All credit goes to this blog for pointing me in the direction of cheap and cheerful meals that are rather successful in picking me up from my ‘I miss hawker food’ and ‘uni stress’ moments. From Thai Boat Noodles to Vietnamese Pho, this South-East Asian food map is almost reminiscent of the typical food centre in Singapore or Malaysia. It had been on my agenda to try ‘Yummy Thai’s’ Fried Fish, so I quickly directed all my attention to the wafting smells of lemon-grass and ginger as Mumma and Pappa began to survey the premises. The number of Thai patrons ordering from this stall had me a little excited at the prospect of its authenticity. This entry was posted in Cheap Eats, China Town, Fish, Kimchi, Korean, Seafood, Sussex Street Food Centre, Sydney, Thai, Uncategorized and tagged beef, bulgolgi, cheap eats, chinatown, dinner, fried fish, kimchi, korean, seafood, sussex street, sussex street food centre, wooree bbq, yummy thai on January 29, 2013 by helloitsming. Hello Sydney! I am now back on the Sydney foodie scene and blogosphere; however I come baring sad news for the blog. My hard drive containing all my foodie photographs has succumbed to a horrible fate and is no longer working. I have sent it off to the ‘doctors’ to see if anything can be recovered but that means a large proportion of my holiday snapshots are ‘lost in transit’. I was hoping to share with you some of my favourite eats of all time, festive feasting and much loved memories from my trip, but I am not sure if such an event will occur. Fingers crossed that the photos can be saved!! In the interim, while I anxiously await the news of my hard drive’s fate, I thought I would share my first Friday night family dinner in Sydney for 2013. Every Friday, my family picks up a tired and hungry Mumma from work and either head straight to our favourite/staple restaurant Golden Century or to a new destination, which I have scouted out according to everyone’s food craving. It is a time which we end our busy week (and maybe celebrate ‘FRIDAY’) as a family with the company and sharing of good food – an unspoken tradition. The first 2013 Friday in Sydney, led us towards Pyrmont in search of Italian cuisine, which Lil’ Bro had his heart set on. A bowl of hearty pasta and a cheesy wood-fire oven pizza had been overlooked on our stay in Singapore, as 99% of the time we opted to filled our bellies with the local cuisine – no regrets! We headed down Harris St, planning to dine at The Stars @ Pyrmont; a quaint Italian joint, however the sweltering heat had us make a double take when we stepped into its non-air conditioned premises. The 45degree heat was too much to handle and we just needed somewhere cool and comfortable. 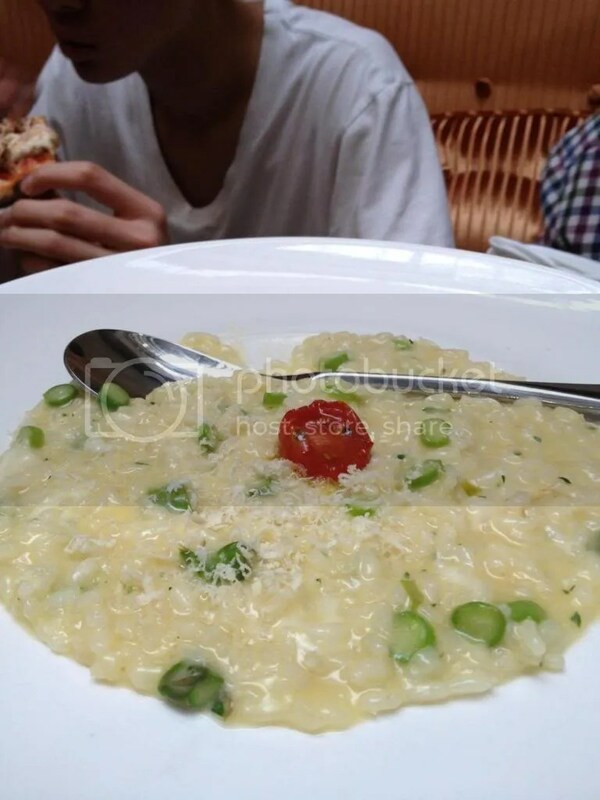 Mumma had recently attended a function at Signorelli Gastronomia, which was just a stone-throw away and after hearing rave reviews about it over the blogosphere I made a beeline for the car and gave instructions to Pappa to take us to the air-conditioned bliss! We arrived around 6.30pm to find the restaurant rather quiet for a Friday night, although we were a little early. The restaurant has seating within its own premises, which spills out into the bright and airy lobby of the office building in which it is situated. We were seated at a comfortable bunker in the lobby and immediately began our search through the menu. The hunger silencers of bread were brought to the table and I could not resist the crunchy crusts accompanied by the airy and soft innards. I have serious regret for not snapping a photo of these delights! Ah the simple things in life! Sometimes their enjoyment is emphasised by the company of loved ones and cherished routine. Our hunger drew our eyes straight to the main courses – we wanted a hearty meal and we wanted it straight away! Being our first time dining at the restaurant, there were too many wonderful pastas to single out just one; from ‘Hand Made Ravioli’ to ‘Squid Ink Linguine with Alaskan Crab Meat’ and the mysterious ‘Risotto of the Day’. “The result of this wide selection?” you may ask. Mumma, Pappa and I decided upon three pasta dishes to share, ‘Potato Gnocchi’, ‘Risotto of the Day’ and ‘Spaghetti Chitarra’. The ‘Potato Gnocchi’ was wonderfully flavoured! 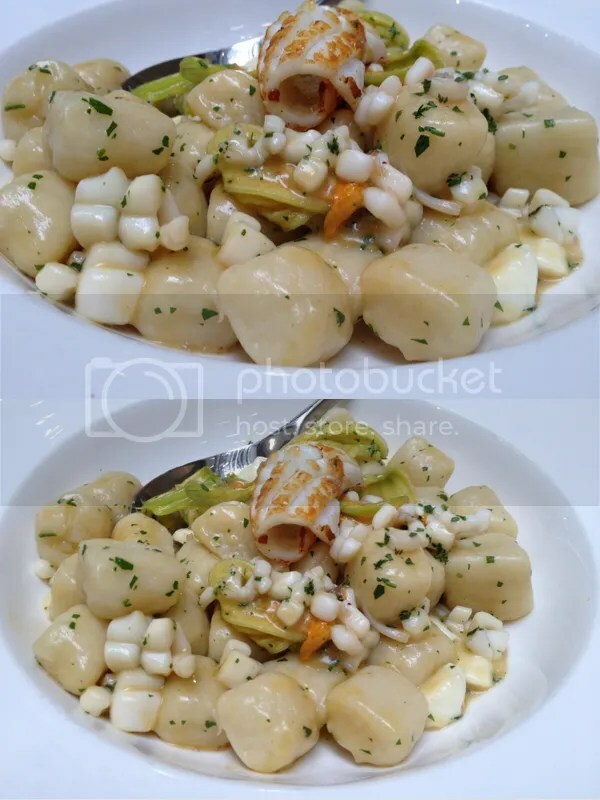 It was definitely one of the best gnocchi’s I’ve had in a long while – retaining its chewiness, which was in perfect balance with the generic description of ‘fluffy goodness’. It did not fall apart and crumble, nor did it melt into a gooey blob when popped into my mouth. Instead, the perfectly cook pillow was texturally smooth and was surprisingly sweet, hinting at the pure freshness of the ingredients. Ok, enough about the gnocchi itself. The other stars of the dish were Calamari, Zucchini Flower and Buffalo Mozzerella. My seafood yearning stomach was absolutely satisfied by the juicy, seared calamari. The texture of the calamari was complemented wonderfully by the slight crunch of the zucchini flower and soft, subtle mozzerlla. Mumma was in love with this dish! My pick was the ‘Risotto of the Day’, a combination of Smoked Scamorza, Fresh Horseradish and Asparagus. I was completely blown away by this dish and may have even preferred it to the “Potato Gnocchi” as the flavour had a real ‘kick’ to it. ‘Scamorza’ is a type of Italian Cow Cheese and its smoked flavour was what I found to bring the components together, with the more subtly flavoured asparagus. It wasn’t a texturally complicated cheese, thus providing the flavour and letting the texture of asparagus and horseradish shine, ringing true to the meaning of “Gastronomia” – “the art and science of good eating”. The beauty of sharing is the ability for each diner to experience the delight of the dish as well and who better to spread the foodie love with than the family at the end of the week? Pappa thought the ‘Spaghetti Chitarra’ sounded interesting, however I think we were all a little disappointed with this dish as it paled in comparison to the wonderful flavours of the previous two. 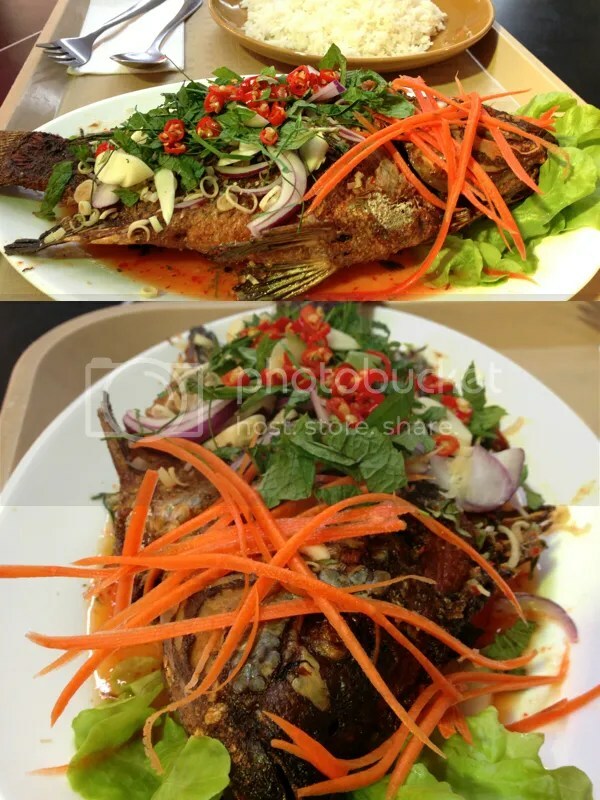 Nevertheless, it is still worthy of praise – if I had not tried the other two dishes I would have been quite happy with this dish. 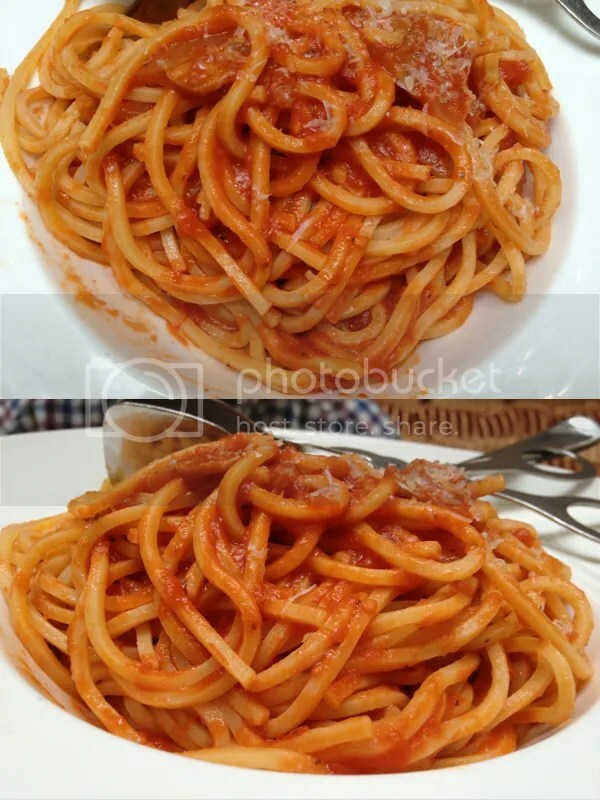 The spaghetti was cooked Al Dente and had a very different texture as it was handmade! You could almost taste the effort that had been poured into creating such a simple base ingredient. The ‘Chitarra’ was described as ‘pork cheek’ by the waiter and was scattered throughout the spaghetti, however I didn’t feel like it provided much flavour as the tomato base seemed to dominate. 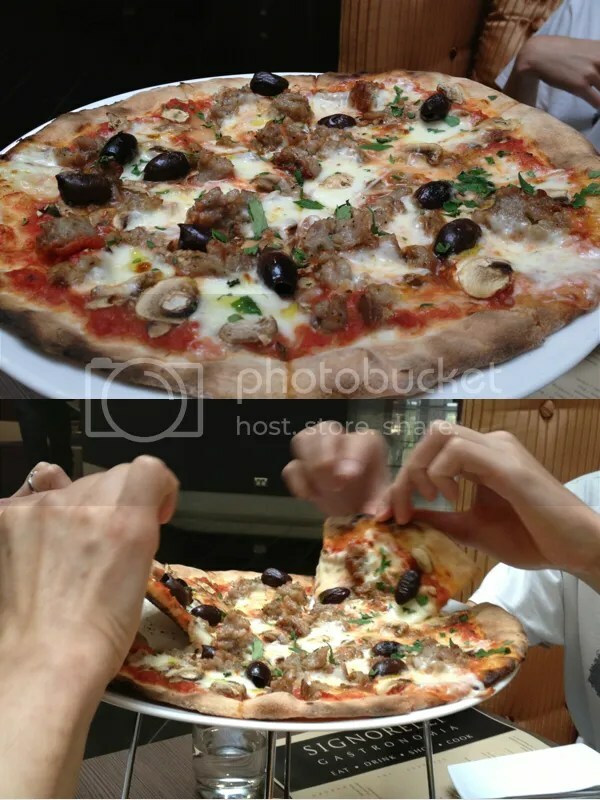 Lil’ Bro was the odd one out as he chose to order ‘Stone Fired Oven Pizza’ with Italian Sausage, Mushrooms and Olive. Taking ‘ownership’ over a majority of the pizza, we decided upon a trade – some pasta for some pizza. Mumma had been raving about their pizza after her function and it definitely lived up to expectation. We were in delight with wonderfully thin base and oozing cheese, which subtly complemented the stronger flavours of the sausage and olive. Pizzas always remind me of relaxing nights in front of the television with the family, so it definitely brought something comforting and sentimental to the table. 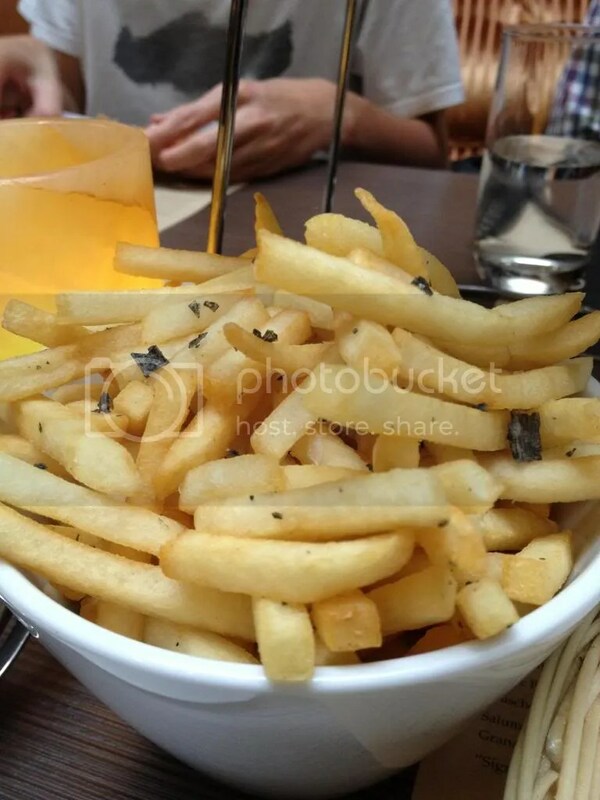 As an accompanying snack, we couldn’t resist the bowl of fries, which were well cooked – not too oily and sprinkled with an interesting black salt. After the clearing of his plate, Lil’ Bro looked at us with wide eyes and asked, “Dessert?” The good thing about Friday dinners, is our stomachs’ default to ‘Indulgent Mode’. I spied the words “Salted Caramel” on the menu and that was basically the end of it. We ordered two “Salted Caramel Crème Brulee” as there would not be much sharing from the boys end of the table! It was a well done dessert with the flavour of caramel taking on a perfect level of decadence, however I was quite disappointed with the missing ‘salty’ kick that I was holding out for. I would have enjoyed the glaze to be slightly more ‘burnt’ as well, but the caramel flavour and crust had me quite happy. 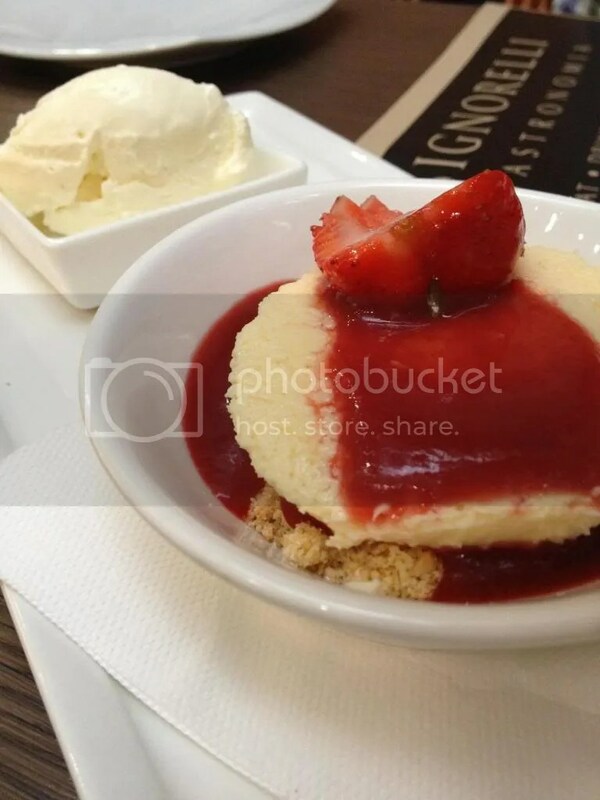 Mumma suggested the “Baked Strawberry Cheesecake” and how glad I was that she did! I found it to be even better than the “Crème Brulee”, with the subtle and light cheese playing well with the more acidic and sweet flavours of the strawberry. Overall it was a casual and simple but delicious experience; however try to be seated within the restaurant itself as diners in the lobby are sometimes forgotten! 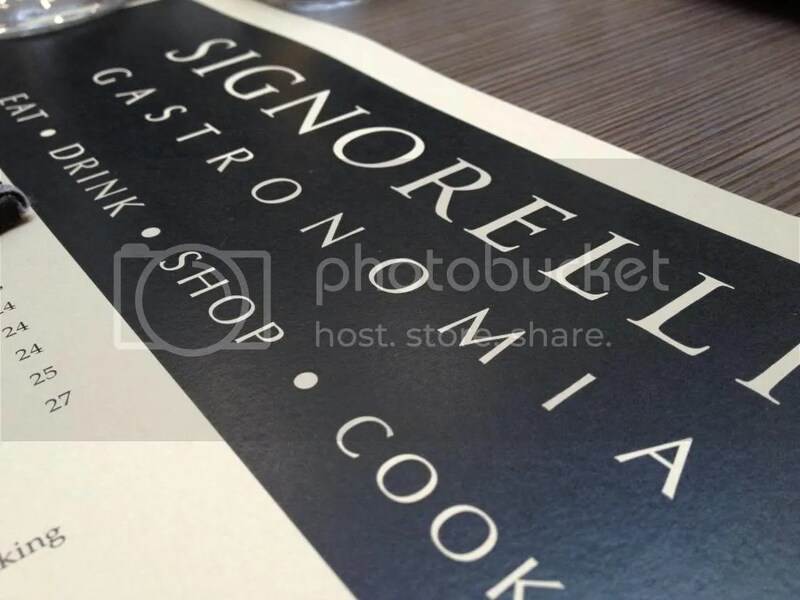 So if you’re in Pyrmont looking for a good eat, keep Signorelli Gastronomia in mind. This is definitely a Friday dinner destination from now on, calling for visits to try their famous ‘Antipasti’ and other pasta dishes. It is this unspoken tradition that has led to my experience of many different cuisines and the strong bond of the family – we are able to enjoy each others’ company within our busy schedules and uplift any negative tiredness or stressfulness with conversation and food! 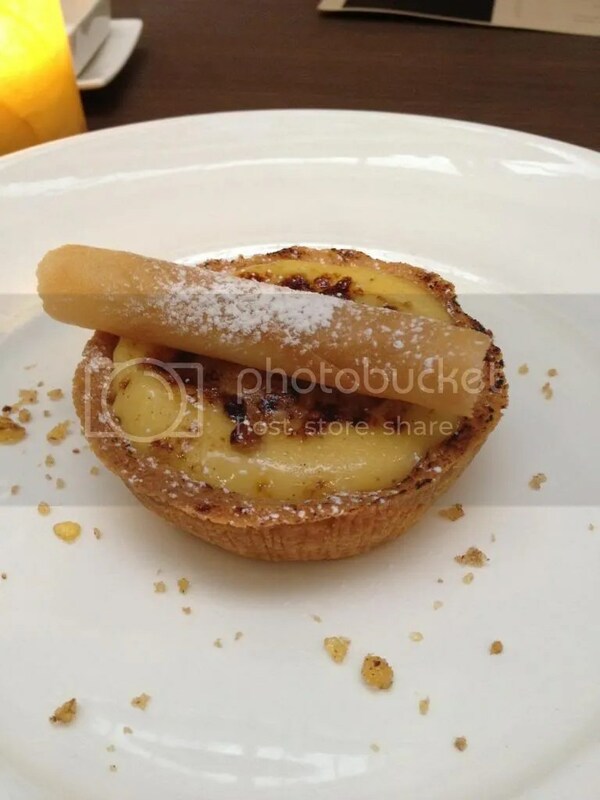 This entry was posted in Cheesecake, Creme Brulee, Gnocchi, Italian, Pasta, Pizza, Pyrmont, Restaurant, Risotto, Salted Caramel, Seafood, Sydney and tagged cheesecake, doltone house, gnocchi, homemade, italian, pasta, pizza, pyrmont, restaurant, Risotto, salted caramel, signorelli gastronomia, spaghetti, sydney on January 23, 2013 by helloitsming.